(18/P031) TRENTON – First Lady Tammy Snyder Murphy and Department of Environmental Protection Acting Commissioner Catherine R. McCabe today celebrated Earth Week at a Long Branch elementary school that is developing the next generation of environmental leaders through green-focused programs that have earned national recognition. The visit to George L. Catrambone Elementary School is one of several visits Acting Commissioner McCabe is making this week across the state to share DEP’s mission with children and encourage them to be environmental leaders. 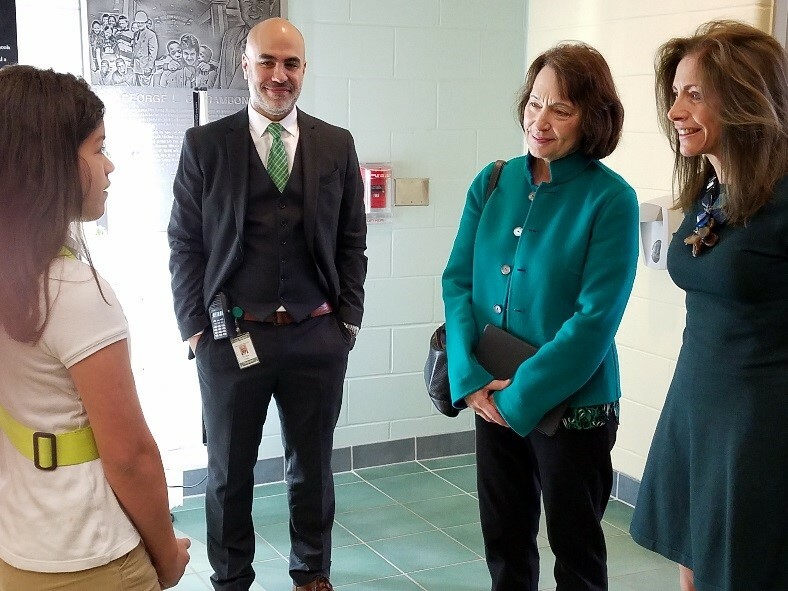 The First Lady read a proclamation declaring Environmental and Sustainability Education Week in New Jersey, and talked to students and staff about leading by example as well as key environmental issues the state faces, such as climate change. The First Lady and Acting Commissioner McCabe participated in a question-and-answer session with the children. They also watched presentations about the school garden and several green-focused initiatives that have helped the school save thousands of dollars. Those efforts will have long-lasting effects on the children, Long Branch Public Schools Superintendent Dr. Michael Salvatore said. “Inspiring young children can spark the engineering of a mindset that will create the foundation necessary for a culture of sustainability,” he said. Since opening in September 2014, the K-5 school’s commitment to green-focused education has earned it several prestigious honors. 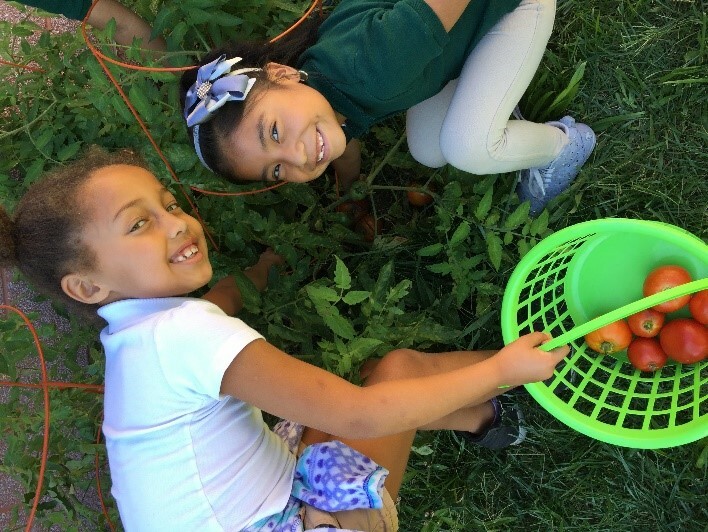 In 2017, the U.S. Department of Education awarded the school a prestigious Green Ribbon for meeting three core principles: offering effective sustainability education, improving the health and wellness of students and staff, and reducing environmental impacts and costs. As we celebrate Earth Week, it is important to show our children that environmental issues matter as much today as they did on the first Earth Day in 1970. I congratulate George L. Catrambone Elementary School for the outstanding work it is doing on many levels – and for its inspiring commitment to programs that are shaping our future environmental leaders. The school achieved these core principles by tracking and decreasing energy consumption; using reusable lunch trays; growing herbs and vegetables in an outdoor sustainable garden; conducting biweekly workout classes for students and staff; and repurposing aluminum juice pouches into lunch boxes and wallets. In addition, the school and students use an outdoor classroom for instruction, where they set up rain barrels to collect water. They also constructed an impressive greenhouse out of 1,500 recycled two-liter soda bottles, helping students to increase the amount of produce they can grow for the community and school. The school also worked to eliminate single-use water bottles in its building by selling reusable water bottles as a fundraiser and installed bottle-filling stations throughout the building. Students have also stopped using plastic drinking straws out of concern about the potential impacts they may have on nearby beaches and marine life. The school’s 5th graders also presented their “straw free” initiative to members of the Long Branch Environmental Commission. When constructed, the school integrated Leadership in Energy and Environmental Design (LEED) practices, a green-building rating system that measures environmental performance. As part of this initiative, students and staff work with an outside vendor to track utilities usage. A group of second- and fourth-graders partner with New Jersey Natural Gas and the Alliance to Save Energy to learn how to reduce energy consumption. In practical terms, this means students are sure to turn off lights when leaving classrooms and shut down computers not in use. These efforts helped the school cut energy consumption by 40 percent, resulting in $20,000 in utility cost savings in the 2015-2016 fiscal year. The school has also reduced annual water use by more than 9,000 gallons through conservation measures. In addition, more than 85 percent of the school’s nearly 850 students take the bus to school, with many others carpooling. “Over the past three years, the students, staff, and members of the George L. Catrambone school community embarked on a school-wide initiative to educate, promote and bring awareness to the children of our school, on the importance of sustainability, energy conservation, recycling, and the multitude of ways that we could promote healthier living and improve the earth's environment,” Principal Christopher Volpe said. Other honors for George L. Catrambone Elementary include Silver Certification from Sustainable Jersey for Schools; 2017 Elementary School Sustainability Champions; an Eco-Schools USA Green Flag from New Jersey Audubon and the National Wildlife Federation, in recognition of the school’s sustainability efforts in the areas of energy efficiency, waste disposal, water conservation, and its environment-focused curriculum; and Energy Star certification from the U.S. Environmental Protection Agency.